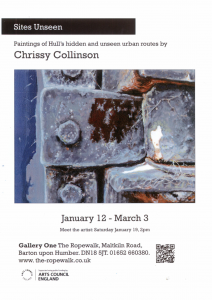 Come and see the paintings of Hull’s hidden and unseen urban routes by Chrissy Collinson at the iconic Ropewalk! 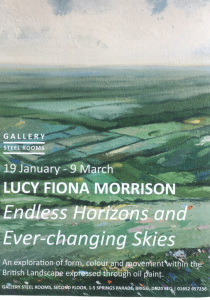 Lucy Fiona Morrison presents the Endless Horizons and Ever-changing Skies exhibition at the beautiful ropewalk gallery, in Brigg. There’s not much going on in the garden at this time of year. But at the Ropewalk in Barton-on-Humber one particular garden will soon be blooming. And from January 19, there is the chance to visit what is a unique creation, a landscape made up of clocks of every kind. The brainchild of international installation artist Luke Jerram, Harrison’s Garden – which honours Barrow-on-Humber inventor John Harrison – will feature hundreds of clocks laid out in swathes of beds and borders. Harrison’s Garden has recently completed a tour of National Trust properties and was due to be dismantled. However, a chance meeting with Luke led the artist to donate the exhibition to the Better Barrow Community Project which is raising money for a statue of John Harrison – and to offer to set it up. The Ropewalk in Barton-on-Humber agreed to stage the exhibition and is now awaiting the imminent arrival of more than 2000 clocks. Harrison’s Garden opens at 10am on January 19 and after it closes on March 24, Colin Young from Golding Young and Mawer in Lincoln – and Bargain Hunt fame – has agreed to auction the most valuable timepieces, while the remainder will be offered as momentoes for a small donation. Luke Jerram is known for his innovative ideas, most recently his Museum of the Moon project seen in Hull. “We were fortunate to meet Luke when Harrison’s Garden was at Gunby Hall,” explained Trevor Millum, chairman of the Better Barrow Community Project. “The exhibition was moving on to Penrhyn Castle after which it would have been dismantled so we’re really pleased it will finish in John Harrison’s backyard. Come and join us for songs, stories and much more to encourage language development. multiple learning disabilities, including dual sensory impairment and autistic spectrum. Booking is essential for this activity. A lively stay and play session in the large community room at the Side by Side Children’s Centre. A variety of play and learning activities for children. A chance for parents to meet other parents and talk to staff about any concerns that are affecting their family. Suitable for 0-5 years in term time, older children welcome in holidays. Opportunity for childminders to come and play and mingle with other childminders at Henderson Avenue Children’s Centre. Opportunity for Childminders to come and play and mingle with other childminders at Frodingham Children’s Centre.